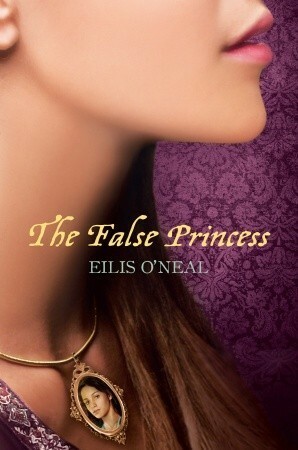 The False Princess by Eilis O'Neal. Grades 6 and up. Egmont USA, 2011. 320 pages. Review copy provided by my local library. Princess Nalia's days are spent in study and reading, occasionally exploring the castle grounds with her best friend Kiernan. Until suddenly Nalia's life is turned upside-down. She is informed that she's not actually the real princess, but a stand-in, chosen to thwart a dooming prophecy made about the princess on her birth. Nalia's real name is Sinda. She must leave the castle and start a new life with her only living relative, an oddball aunt in a tiny backwater town. Sinda is crushed by the loss of the only life she's ever known, but soon more important issues arise. And Sinda finds herself caught up in a deadly mission to protect the true heir to the throne. First of all, Sinda is a character you'll love to love. She's caring and very much imperfect, and when her life is turned completely upside down (which happens more than once), she perseveres. Sinda finds a way. She may not be the most coordinated. She may even be timid and shy, but Sinda's not giving up. And she grows so much throughout the book that it was really a pleasure to see her coming in to her own. It's not necessarily a story that's focused on character development (there's a lot going on, plot-wise), but when you reach the end you can really see how much Sinda grew and changed throughout the course of the novel. The plot is twisty-turny, but never in a way that felt implausible. And I actually never saw anything coming (I maybe thought I did, but I never actually did!). Everything fit together and threads started in the beginning of the book come back around at the end of the book. The intricate plot makes for a very rich story and plot points were tight, making it a satisfying story, too. There's definitely a bit of romance, and kind of a swoony one, too. You'll definitely be rooting for those two crazy kids to get together, but it's all very PG. This is a great choice for tween fantasy fans, particularly those who enjoy an adventure story and some romance. Readalikes: The first series that came to mind as I was reading was the Song of the Lioness Quartet (starting with Alanna: The First Adventure) by Tamora Pierce. The political details of Tortall and the strong female narrator may appeal to readers of The False Princess. I'd also recommend Graceling, Fire, and Bitterblue by Kristin Cashore for their intricate political details. Particularly Bitterblue, which is a story about a young queen coming into her own. Bitterblue's journey is similar to what Sinda goes through and the volume can stand alone, although readers won't want to miss Cashore's other titles and Bitterblue is probably richer for having read the first two books.